Rules: You may chose where you put your flag but it has to be within your area. The flag and its stand cannot be detroyed nor moved from where you have put it. The fla can only be removed from its stand by someone or somethings hand. The flags cannot be used as weapons. Must have all 3 flags placed onto your sand to win. The entire area is moutains except to the bottom where there is a tiny bit of forest with normal sized trees. All the way to the top of the moutains is a little platform, a flat spot. This bridge links the moutains to the Industrial zone. Right bellow the bridge is a long drop do to the water fall and all the way down are long sharp rocks that will stake through you if you fall onto them. The indistrial zone has an unfinished road running through it heading towards the forest area with its factories near the ocean. On the other side of the road are all the buildings and such that the workers once used. There are no trees in the industrial area, just short dead grass do to all the polution. 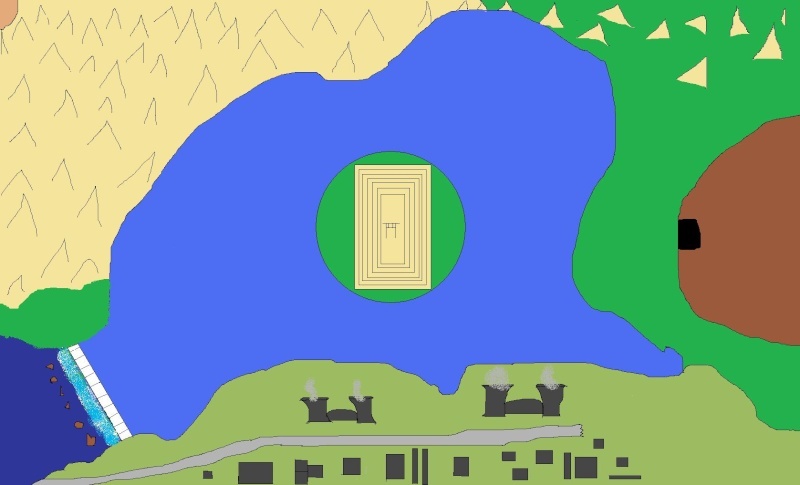 The cave is to the far right of the entire map. It is a very large cave with an opening large enough to fill the entire cave with light so you will be able to see in it. Serounding the entire cave is a huge forest with thick trees like those within the forest of death. To the top is a chain of moutains leading to the mountain area. Right smack in the middle of the entire area serounded by the ocean is a small island. On this island is a large temple standing ontop of hundreds of steps. Serounding the shrine is a forest much like that at the bottom of the Moutain area.